In a continuous effort to make Mobile App Development a breeze, Configure.IT today made a revolutionary announcement exclusively for the students. For the most promising career option today as an App Developer, the opportunity Configure.IT has opened up for the to-be-developers is going to open widespread possibilities for newbies to experiement, learn and adopt the entire mobile ecosystem specially with the development. “We met with a bunch of universities and colleges to see how they teach app development, to see how if Configure.IT fits into the learning process. We could clearly distinguish the way they were learning versus what’s required to become a pro. The approach is completely different. And that’s what we want to help with – by making the platform accessible to students without any hurdles and any fee” – says co-founder Mr. Ram Chhawchharia. The completely drag-and-drop and configuration-based platform can hugely accelerate the grasping of entire development lifecycle for an app to be created without deep learning of multiple technologies. By making the platform entirely FREE forever for the students to come and start scratching upon their ideas, is one way to accelerate this process. They don’t need to learn all the complex stuff, but dive into the platform that doesn’t require them to code upfront. To get special student access to the platform – student just need to sign up and send a special request with their student ID card to enable the free access. “We’re also open to tie up with universities and colleges for a special group access to the students for the innovative way to accelerate the app development education and make it easy” says Jigar Panchal, Director of Marketing. Configure.IT is a cross-platform App Development platform, that empowers developing 100% native, customizable and extendible apps and backend, without writing code. The solution provides infrastructure free solution for developers, startups and enterprises, to build mobile solutions that doesn’t require great skills, experience and technology expertise. Configure.IT commits to spread its wings wider! Configure.IT announces today flurry of upgrades to the platform, that are scheduled to be launched within Q1 2016. This is the biggest upgrade in a quarter since the launch of the platform back in September 2014. While the platform has seen a plethora of enhancements, new features and upgrades – this is by the far the most extensive and major announcement in recent time. In Q1, the platform adds to its bag the support for two popular database engines, MSSQLServer and PostGreSQL. They both rank very close to the most popular database engine, MySQL (already supported by the platform). This will widen the opportunity for the enterprises and small businesses to align their needs and existing systems for building apps with Configure.IT. The platform also promises to upgrade their mobile apps offering, by making two most forward looking announcements for both iOS and Android Platforms. On top of option of downloading Objective-C code for iOS, the platform will support an option for downloading entire source code in Swift 2.0 – which is heavily promoted by Apple®. For Android, the apps will be now fully compatible with Marshmallow (Android® 6.0) which is the version used by many new Android Phones. Configure.IT is also excited share that we have been shortlisted for participating as SURGE 2016 ALPHA Startup and will also be a part of the PITCH event, to be held on 23rd and 24th February 2016 in Bengaluru, India. PITCH is the startup competition at SURGE that brings together the world’s leading early-stage startups for a live onstage battle. PITCH features 40 of top exhibiting startups. “We have got great plans lined up for 2016 for making app development process easier, and most importantly, ensure we enable new ideas for startups and enterprises to be implemented by reducing dependency of technology and skills” – says Co-founder Mr. Ram Chhawchharia, who is highly optimistic about nurturing startups. On behalf of the entire team, we wish you a Very Happy Holidays in advance! As we approach Christmas, a big Configure.IT gift is ready for the developers. 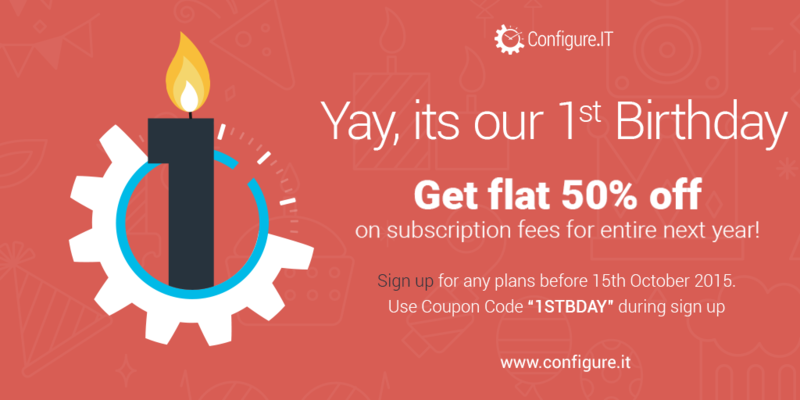 Configure.IT offers a massive discount of 50% for all the new subscriptions for the next one year. This offer is valid till 15th January, 2016. 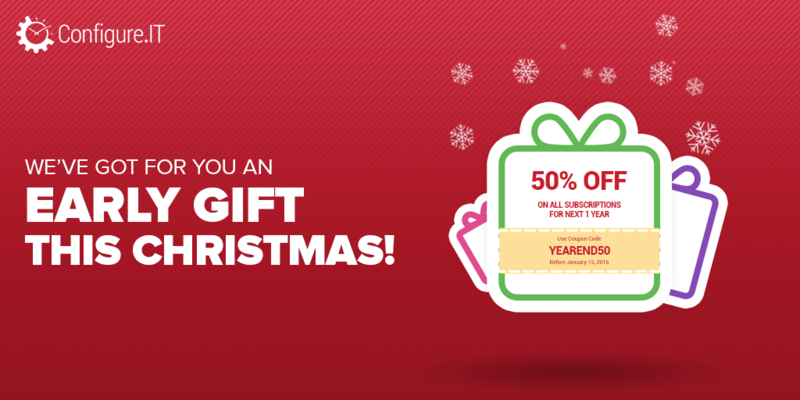 To get the benefit of this offer, Sign Up with the following Coupon Code : YEAREND50 to avail the offer. If you subscribe in Monthly Scheme, then for whole one year you can renew with the same discounted price. Configure.IT has recently celebrated the first anniversary of its launching. On this special occasion & by getting a grand success in the first year, we announce the Special Anniversary Discount, flat 50% off on subscription fees for the entire next year. If you are a first-time user and want to test all the aspects of Configure.IT, you are free to use them without paying any amount. Furthermore, to develop an app in collaboration with others to speed up the project, users can choose the ‘Team’ package. The other plan, highly recommended by the team of Configure IT, is ‘Personal’ package for a single user. This plan is highly useful for the single user to build an online app. Users can build three projects with unlimited screens and 100DB tables along with 1000 APIs per project through this plan. Additionally, users can get all the advanced features and priority support for the real-time assistance. This package is available with a price of $169/month for an annual subscription, while to subscribe for monthly plan, users need to pay $199/month. With this plan, three users can work on the same project. This plan allows 10 projects to make, with unlimited screens and 500DB tables with 5000 APIs per project. Moreover, users can get all the advanced features and priority support for real time assistance. 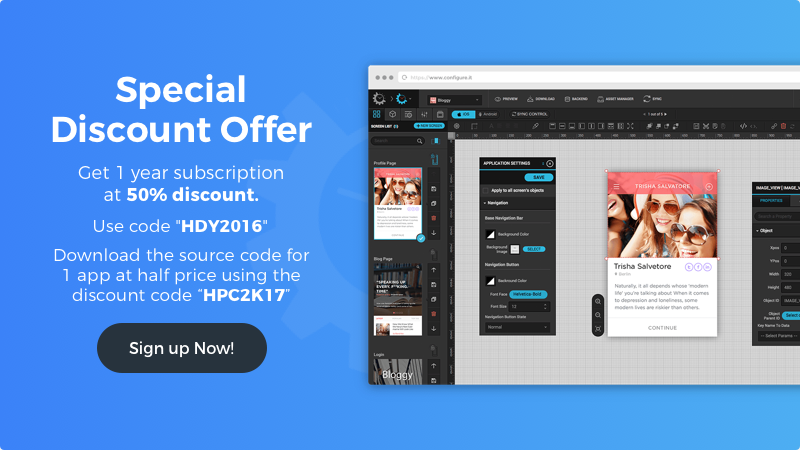 This package is available with the price of $424/month for an annual subscription, while to subscribe monthly, users need to pay $499/month. With this package, users can make a single project with 5 screens and a tight backend configuration for iOS and Android platforms without any cost. Moreover, this package gives 5DB tablets with 10API for customization. To avail any of these special offers, users have to sign up before 15th October, 2015 with the coupon code “1STBDAY”. Configure.IT is a revolutionary cloud-based platform to build a native mobile app for Android as well as iOS without writing a single line of code. This platform gives a complete set of tools to develop an app from scratch to finish, just by drag-and drop. Additionally, this platform gives a flexibility to re-use its every aspects right from display control, app screens to entire app itself. Moreover, Configure.IT proved itself as one of the best cross-platform app development tool in the app community by winning the Aegis Graham Bell award for Mobile app development and delivery for the year 2013. If users have any query, they can find the solution at Support center or ask questions directly from the Contact Us section or live chat option is also available to solve the query instantly. Configure.IT, an online mobile app development platform, is going to launch Android support. Right now, Configure.IT offers mobile app development facility for the iOS platform. But, from July 15, 2015, it starts the same for the Android platform. Configure.IT, a platform for developing customized mobile applications, offers mobile app development from scratch. Features like minimal coding, preview facility, and rich libraries give it a distinct identity among peers. In answer to the question regarding features, the co-founder told: “Features will be the same as those for the iOS platform. Enough care has been taken in keeping both features and functionality the same in both the versions.” “It is going to be a handy platform for both Android and iOS developers.” He concluded. Features including 35+ native controls for developing native apps, integrated image editor, reusability, multilingual support, and preview are the same in both versions. All existing and new users and developers will get Android support from July 15, 2015 onward on Configure.IT without paying any additional charges. Now onward, users can either develop an app for both the platforms or after developing an app for one platform, they can simply import it on another platform. Most solutions available in the market today, provide only part of the entire app development. Some specialize in Backend services, others provide API layers and yet another category enables configuration on the app front. 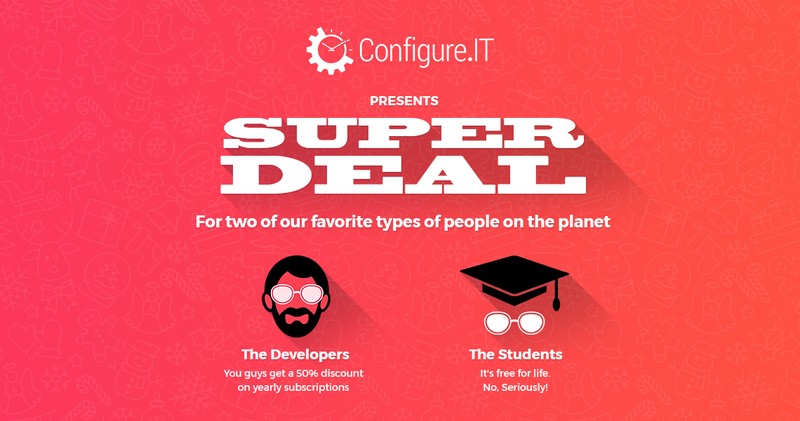 Configure.IT on the other hand brings together everything that you require to develop an app, under one roof. Being entirely browser-driven, it allows its users to work at anytime and from anywhere. The degree of flexibility and independence that the platform offers is one of its core competencies. As it focuses more on configurations and less on coding ,Configure.IT provides fully configurable app setting and a whole slew of library features. A direct user interface that binds with the API lets users perform iterations extensively. The platforms lets users reuse almost anything right from display controls, app screens to entire applications itself. Another feature that makes the platform all the more versatile is the live app testing facility through an app previewer tool. This facet of the platform enables developers to test the app real time, significantly improving UAT as most codes are machine generated. Equipped with all the features and functions to make developing apps a more simple and easy process, Configure.IT is expected to make huge waves in the IT industry. We hope to create a platform that enables developers or users to be able to develop applications that are completely standardized, completely customizable and adhere to the best practices norms.